June 14th 2007 are the tour dates. In our own private bus, we will be traveling to three different areas of the Pantanal in Brazil that I have personally experienced and are among my favorite spots because of the abundance and variety of wildlife. We will be visiting and living on privately owned lands---huge ranches which encompass thousands of acres for as far as the eye can see. For our daily safaris, I’ve made arrangements for two vehicles with two experienced drivers and two naturalists/guides which will insure finding our subjects and provide us comfortable shooting space. 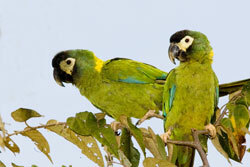 The Pantanal stands as one of the world’s great natural wonders with its extraordinarily concentrated and diverse flora and fauna, and a landscape that spans a variety of ecological sub-regions. This area of the world is an unequaled wildlife sanctuary containing hundreds of species of birds, huge varieties of butterflies, and mammals such as Capuchin and Howler monkeys, anteaters, capybaras, crab-eating foxes, and tapirs to name just a few. Caimans, anacondas and numerous species of lizards are just a few of the reptiles we will be able to photograph. 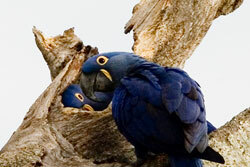 Many endangered and rare species like the jaguar, ocelot, giant river otter and increasingly rare Hyacinth macaw make their home in the Pantanal. 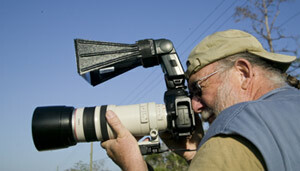 This is truly a wildlife and nature lover’s, birder’s, and/or photographer’s paradise. Visit my website and view some of the images taken this last July. 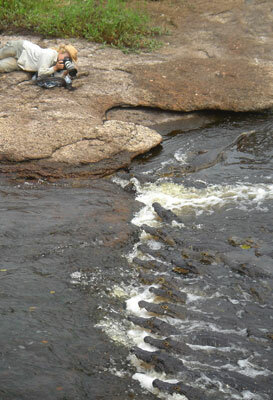 You do not need to be a photographer to go on and enjoy my Joanne Williams Pantanal Safari 2007!!! You will fly to Sao Paulo, Brazil (I fly from Miami on Tam Airlines) where your tour begins when you catch your flight to Campo Grande. Due to the overwhelming response from my last newsletter #38, this tour will no doubt book up very quickly. Also, I have booked the lodges this far in advance as this is the “primo” time of year. If you are at all interested being added to the group, a non-refundable $500.00 deposit is required. Please make checks payable to: Joanne Williams Photography, Inc.
group) upon request prior to trip. On September 5th, my group and I leave Miami International Airport on British Airlines. Our destination is Nairobi, Kenya, but with a stop over at Heathrow Airport, England. As always, flying safely with all our camera gear is a challenge to all photographers. After the latest terror threats that challenge seems almost insurmountable. Rules and restrictions have tightened up so much with what you can or can’t carry on board, (it was nothing ten days ago on BA), the amount of weight in checked bags, etc. etc. etc. These rules seem to change daily from airport to airport, country to country. One member of my group still uses film. Do we auction of the first-born child to pay for the cost of the Fed-ex delivery to Nairobi? Film is heavy, especially if you are taking about 300 rolls! We’ll be gone 21 days, traveling into Tanzania, as well as the Masai Mara, & other parts of Kenya and he’ll need that many rolls if we are as lucky as we’ve always been seeing and shooting great wildlife. (Chalk one up for digital). 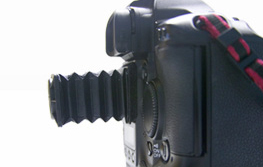 If you are a digital shooter, you need your laptop and/or more hard-drives, with special charging cords etc. etc. This can get to be quite heavy & bulky, but the restrictions are allowing less and less weight. (Chalk one up for film!) At this writing, I don’t have the answers except to bless those souls who discovered the terrorist group that would have murdered hundreds of people. I will make every effort to lighten the load, read on the internet what is that day’s restrictions for flying, bite my tongue when my water or chapstick or my powerbar goes under scrutiny. It may be a few hours of inconvenience and downright ‘hell’, but there is a great reward at journey’s end. Visit my website and view some of the images from my last Joanne Williams African Photo Safari and other safaris shown on the website.